Furniture exports were up strongly in 2014 though Ireland — which represents UK producers' biggest market — proved an exception despite what was clearly a strong year for Irish furniture retail sales. Dunelm says expanding its furniture category is at the heart of ambitious plans to grow sales across the home furnishings chain. John Lewis is to open a dedicated distribution centre for furniture, furnishings and electricals at its Magna Park logistics hub in Buckinghamshire. Is the Sofa.com sale good news for MADE? Retail sales grew faster than the 12 month average in January as retailers beat strong comparatives for the same month a year ago. Seven in every ten consumers are planning to make a purchase for their home this year, with floorcoverings top of the wish list. Private equity company CBPE has acquired a majority stake in the multichannel upholstery retailer Sofa.com. Revenue rocketed past €100m in the first nine months of 2014 for mainland Europe based online furniture retailer Home24. Sofa chain DFS has confirmed plans to return to the stock market in a move it hopes will raise cash to pay down debt. Home sales were up 7 per cent at John Lewis as md Andy Street lauded high-ticket categories in the final few days of January. Sales at Hypnos grew by a fifth for a second successive year in 2014 as the bed manufacturer capitalised on growing demand in the retail sector. Unsecured creditors of a multi-site high street South East beds and mattress retailer will receive a final dividend under 1p for every pound owed after rejecting modifications to a CVA. The double-digit growth trend at expanding sofa manufacturer Buoyant Upholstery continued in the first year since it was acquired in a private equity backed MBO. Wholesale giant Headlam has added one the country’s largest remaining independent carpet distributors to its growing roster of businesses in a deal worth £2m. The group behind sofa firms G Plan Upholstery, Parker Knoll and Duresta has been sold to its management and an investment firm headed by the former CEO of Bank of Scotland. Furniture and accents retailer MADE this weekend opened a showroom space in the Soho area of London, its third in the capital and fourth overall. The organiser of the January Furniture Show has expanded its team into double-figures with two key appointments. 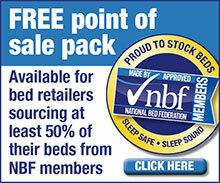 A balance of four in every five furniture stores saw growth in early January trading, according to business group CBI. The co-founders of Dutch furniture and lighting firm Moooi have regained total control of the company after acquiring the stake held by Italian design brand B&B Italia. Beds helped sales climb last week at John Lewis, though the chain was reliant on the web to make up for a 2.6 per cent decline across its stores. A 130 basis point gross margin improvement helped profits rise at Midlands furniture wholesaler Julian Bowen in the year to end June. The addition of a seventh store boosted sales by nearly a fifth at large regional non-food retailer Charlies in the year to end July. General merchandise retailer Argos is to open small format digital stores in Sainsburys supermarkets, the two retailers have announced. Retail giant Tesco’s decision to close 43 stores nationwide will have a major impact on physical store space devoted to furniture and other Home category lines. Worldwide profits at IKEA were flat despite rising sales across many of the markets in which it operates, the retailer said. Furniture retailers continued their 2014 growth run in December with stronger year-on-year trading than any other product category. Home furnishings, design and lifestyle retailer Monoqi has acquired assets belonging to MyDeco, the heavily backed UK based Internet venture. Upmarket retailer Feather & Black has hired a former senior Orla Kiely and Robert Dyas executive to the post of commercial and finance director. Memory foam pioneer Tempur has launched mattresses featuring springs for the first time, but its UK md says there are no plans to launch the line here. Falling gross margin dragged profits down by a quarter at eleven-store bedroom furniture vertical Starplan in the year to end April. Premium bedroom and lifestyle retailer Feather & Black is launching the London Collection, a British themed beds range featuring what it describes as the UK’s highest spec mattress. Third quarter sales lifted at national flooring chain Carpetright buoyed by promotional activity and the Boxing Day launch of interest free credit.